As we all know that VLC media player is one the best open-source media player which plays your files with almost every known video and audio formats, Along with it, it can also be employed for online streaming media for which most of media players fails. You can download vlc media player for your android mobile device and can play videos and audios through this great media player. In particular, most of people has vlc player as their default media player because of great-looking features. For instance, you can also use for cutting/recording a part of video/movie, you don’t know how? Learn How to use vlc media player as a video cutter. In addition, you can play youtube videos using vlc media player so in case you don’t have flashplayer installed on your computer, you will still be able to stream and watch youtube videos without any hesitation. For your info, the vlc media player on your android phone will have the following features. One thing is need to be sure that the vlc media player apk free download that we’re going to provide you is still In its beta version which means that the app may have some errors and bugs. It is still for testing purposes and the developers are trying to find the bugs in it and to reduce the bugs in the next and actual version of the vlc media player for android. The beta version are usually released for developers for testing purposes but you can also get access to this and can install it on you android mobile device by downloading the APK file that we had provided at the end of this post. For your info; VLC media player has been built by Videolan developers and by downloading the APK vlc media player on your android mobile, you will be able to play audios and videos with all known formats, as well as can stream online media. The good thing about vlc player is that it supports almost all known networking streaming protocols where several other media players fail. The current and latest version of vlc media player for android is 0.9.7. you can download it from the below link and then send it the phone’s memory or SD card to enjoy the vlc media player on you android mobile phone. Direct Download VLC Media player APK from HERE. 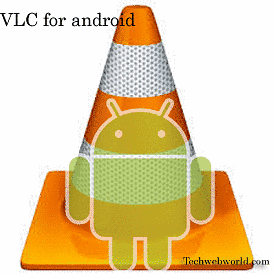 I hope you will love using VLC media player on your android mobile phone. If so then please share this post with your friends too on yous social profiles. Your comments on this post are highly appreciated.